Background and aims: Coeliac disease is characterised by atrophy of the villi and hyperplasia of the crypts in the mucosa of the small intestine. It is caused by an environmental trigger, cereal gluten, which induces infiltration of the mucosa by inflammatory cells. We hypothesised that these inflammatory cells express cyclooxygenase 2 (COX-2), an enzyme that contributes to the synthesis of pro and anti-inflammatory prostaglandins and is known to be expressed at sites of inflammation in the stomach and colon. We have investigated expression of COX-2 in the coeliac disease affected small intestinal mucosa where it may be an indicator of either disease induction or mucosal restoration processes. Patients and methods: Small intestinal biopsy samples from 15 coeliac patients and 15 non-coeliac individuals were stained immunohistochemically for COX-2. Samples from 10 of the patients were also stained after these patients had been on a gluten free diet for 6–24 months. Various cell type marker antigens were used for immunohistochemical identification of the type of cell that expressed COX-2. To further verify colocalisation of the cell type marker and COX-2, double immunoperoxidase and immunofluorescence methods were employed. Immunoelectron microscopy was used to investigate the subcellular location of COX-2. Results: In all samples taken from coeliac patients, clusters of cells with strong immunoreactivity for COX-2 were found in those areas of the lamina propria where the epithelium seemed to blister or was totally detached from the basement membrane. These clusters were reduced in number or totally absent in samples taken after a gluten free diet. No such clusters were seen in any control samples. The density of COX-2 positive cells lining the differentiated epithelium decreased significantly from 13.5 (5.1) cells/105 μm2 (mean (SD)) in the untreated patient samples to 6.5 (2.0) cells/105 μm2 after a gluten free diet (p<0.001), and was 3.3 (1.9) cells/105 μm2 in control samples (p<0.001 compared with untreated or diet treated coeliac samples). Staining for COX-2 was localised to CD3+ T cells and CD68+ macrophages in the mucosal lesions but not all of these cells were positive for COX-2. Immunoelectron microscopy revealed that the ultrastructure of the COX-2 positive cells resembled that of lymphocytes, and the immunoreaction was localised to the rough endoplasmic reticulum and the nuclear envelope. Conclusions: Our results show that in coeliac disease, blistering of small intestinal epithelial cells is associated with accumulation of COX-2 positive T cells, and the number of these cells decreases after a gluten free diet. These observations suggest that COX-2 mediated prostanoid synthesis contributes to healing of the coeliac mucosa and may be involved in maintenance of intestinal integrity. Coeliac disease is an inflammatory state of the small intestine characterised by hyperplasia of the crypts and atrophy of the villi.15 It is caused by an environmental trigger, cereal gluten, which induces infiltration of the mucosa by inflammatory cells. We hypothesised that the small intestinal inflammatory cells express COX-2, which may be an indicator of processes involved in either disease induction or mucosal restoration. The experimental group comprised 15 patients with newly diagnosed untreated coeliac disease (10 women and five men, median age 36 years (range 18–67)). All patients had villous atrophy with crypt hyperplasia which improved on a gluten free diet (mean duration 10.3 months (range 6–24)). Forceps biopsy samples were taken on endoscopy. Specimens after the diet treatment were available from 10 patients. The control group included 15 patients (13 women and two men, median age 39 years (range 17–67)) who underwent gastroscopy because of indigestion or abdominal discomfort, and all had normal small intestinal mucosal morphology. COX-2 was localised using a monoclonal antibody (anti-COX-2, clone 33; Transduction Laboratories, Lexington, Kentucky, USA) (1:100) that recognises the C terminus of COX-2. To determine the type of cell that expresses COX-2, the following monoclonal antibodies were used: anti-CD3 (clone PS1; Novocastra Laboratories Ltd, Newcastle upon Tyne, UK) (1: 40), anti-CD5 (clone 4C7; Novocastra) (1:100), anti-CD43 (clone DF-T1; Dako a/s, Glostrup, Denmark) (1:50), anti-CD45 (clones 2B11+PD7/26; Dako) (1:1000), anti-CD45RO (clone UCHL1; Dako) (1:800), anti-CD57 (clone NK1; Neomarkers, Fremont, California, USA) (1:50), and anti-CD68 (clone KP1; Dako) (1:1500). For immunohistochemical staining, 3 μm thick paraffin sections were cut on ChemMate capillary gap microscope slides (Dako). Antigen retrieval for CD3, CD45, CD45RO, and CD57 was performed on rehydrated sections in a microwave oven for two, seven minute cycles at 850 W in 0.01 mol/l citrate buffer (pH 6.0). In the case of CD68, factor VIII antigen, and laminin, additional proteinase K digestion (Dako) was performed. For CD43, no retrieval was used. Immunostaining was done in the TechMate 500 Immunostainer (Dako) by the labelled avidin-biotin-peroxidase technique using diaminobenzidine (DAB) as the chromogen. The specificity of the immunohistochemical reactions was controlled by omitting the primary antibody or by replacing the primary antibody with an irrelevant antiserum. Known positive tissue samples were used to compare the quality of staining between separate batches of samples. Nuclei were stained with haematoxylin. Double immunostainings were also performed using the TechMate 500 immunostainer. After antigen retrieval, the primary COX-2 antibodies were stained by the alkaline phosphatase-antialkaline phosphatase (APAAP) procedure. The phosphatase reaction, which gives the blue end product, was carried out by hand in Tris HCl buffer (pH 9.5) using 5-bromo-4-chloro-3-indolyl phosphate as the substrate and nitroblue tetrazolium as the chromogen. The second antigen was detected by washing and reloading the APAAP stained objective slides in the immunostainer and staining with the labelled avidin-biotin-peroxidase technique. The peroxidase reaction, which gives the red end product, was done using H2O2 as substrate and aminoethyl carbazole as the chromogen. Counterstaining was done with haematoxylin. Double fluorescence immunohistochemistry was used to show colocalisation of COX-2 with CD3 and CD68. The CD3 and CD68 antigens were detected with the primary antibodies anti-CD3 (clone PS1; Novocastra) and anti-CD68 (clone KP1; Dako) and the secondary FITC conjugated antimouse antibody (Jackson Immunoresearch Laboratories Inc., West Growe, Pennsylvania, USA). In the demonstration of COX-2, the primary goat polyclonal antibodies (Santa Cruz Biotechnology, Inc., Santa Cruz, California, USA) were detected by biotinylated antigoat IgG (Vector Laboratories Inc., Burlingame, California, USA) and avidin conjugated Texas red (Vector Laboratories). In this procedure, colocalisation of the antigens is seen as yellow fluorescence. The pre-embedding technique and indirect peroxidase staining described by Rantala et al were used for IEM of the small bowel biopsy specimens.17 The monoclonal anti-COX-2 antibodies (Transduction Laboratories) of the first phase were followed in the second phase by peroxidase conjugated rabbit antibodies to mouse immunoglobulins (Dako). The peroxidase reaction included H2O2 and DAB, and the reaction product was enhanced by OsO4. Thin sections were examined unstained. The number of COX-2 expressing cells lining the mucosal villous epithelium was estimated according to the principle of Delesse.19 Digital images of 5–6 successive visual fields in one tissue section from each sample were captured using an Olympus BX60 microscope (Olympus Optical Co., Tokyo, Japan; 10× objective) and a digital camera (Soft Imaging System GmbH, Münster, Germany). Each image was overlaid with a grid of 374 points covering an area of 598 400 μm2, and points on the tissue section were counted using computer software (analySIS, Soft Imaging System). All COX-2 immunopositive cells lining the basement membrane under the differentiated epithelium were also counted. The results are expressed as number of COX-2 positive cells per 105 μm2. Statistical analysis of the data was carried out using unpaired and paired t tests. Mucosal lesions with total or partial atrophy of the villi and hyperplasia of the crypts were seen in all 15 initial coeliac disease biopsy samples. After a gluten free diet of 10 months average duration, two of 10 patients showed a completely normal mucosa, and a clear mucosal recovery with only minor changes, such as convoluted or somewhat shortened villi, were seen in the remaining eight patients. All biopsies from control subjects showed normal small bowel mucosa. Patches of cells that showed strong immunoreactivity for COX-2 were present in the lamina propria underneath the basement membrane in all coeliac lesions examined (fig 1A–D). These patches were no longer prominent or even present in the recovering mucosa after a gluten free diet (fig 1E). However, some prominent intraepithelial COX-2 positive cells remained in the villi and the crypts (fig 1E), and their distribution was similar to that in normal biopsy samples (fig 2). These intraepithelial COX-2 positive cells were also present in untreated coeliac disease (data not shown). Localisation of cyclooxygenase 2 (COX-2) expressing cells in sections from coeliac disease affected small intestinal mucosa by immunoperoxidase staining (A–E) and immunoelectron microscopy (IEM) (F). (A–D) Mucosal lesions from four patients showing different degrees of epithelial blistering and increased numbers of subepithelial COX-2 positive cells. (E) Mucosal section from a patient after a gluten free diet (COX-2 positive intraepithelial cells are indicated by arrowheads). (F) IEM of a COX-2 positive cell under the basement membrane, showing the lymphocyte like morphology and COX-2 immunoreactivity in the rough endoplasmic reticulum and the nuclear envelope (the arrows point to the basement membrane). Localisation of cyclooxygenase 2 (COX-2) expressing cells in sections of the mucosa from normal small intestine by immunoperoxidase staining (A) and immunoelectron microscopy (IEM) (B). 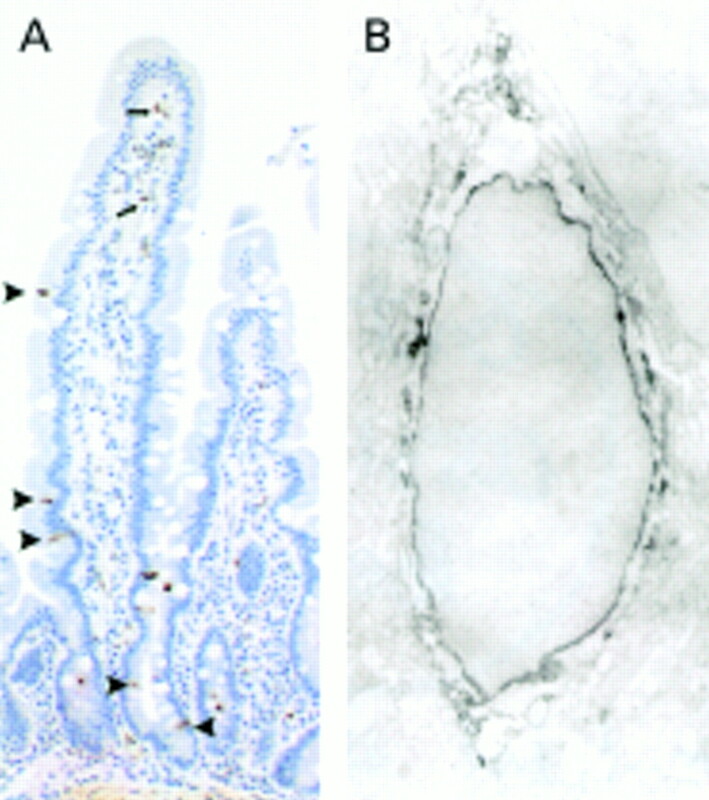 (A) COX-2 positive intraepithelial cells are present in both the crypts and villi (arrowheads) as well as in the lamina propria (arrows). (B) IEM of a COX-2 positive cell showing the lymphocyte like morphology and COX-2 immunoreactivity in the rough endoplasmic reticulum and nuclear envelope. To obtain a more quantitative confirmation of the above finding, we performed morphometric analyses of the cells immunoreactive for COX-2. The density of COX-2 positive cells lining the differentiated epithelium in untreated coeliac disease was 13.5 (5.1) cells/105 μm2 (mean (SD)) and decreased significantly after a gluten free diet to 6.5 (2.0) cells/105 μm2 (p<0.001). In the control samples, the density of COX-2 positive cells was 3.3 (1.9) cells/105 μm2 (p<0.001 compared with untreated or diet treated coeliac samples) (fig 3). The densities of cyclooxygenase 2 (COX-2) positive cells in the differentiated epithelium of small intestinal biopsy specimens from untreated coeliac patients, coeliac patients after a gluten free diet, and control subjects. The points represent values from individual patients, mean values are denoted by horizontal bars, and points connected by a line represent values from the same patient before and after a gluten free diet. In untreated coeliac disease, subepithelial COX-2 positive cells were located in areas where the epithelium seemed to blister or was totally detached from the basement membrane (fig 1B–D), and these cells were not as prominent in areas where the epithelium was more intact (fig 1A). Staining for laminin was uniform throughout the basement membrane which is clearly not a part of the blister structure that involves the epithelial layer only. COX-2 positive cells were not actively proliferating, based on lack of reactivity with the proliferation marker MIB-1 (data not shown). Immunohistochemical identification indicated that the cells in the COX-2 positive areas were CD45 positive, and many of these cells were T cells, as indicated by positive staining for CD3. CD68+ macrophages were also seen. Endothelial cells, identified with an antibody against factor VIII, that were present in these same areas were negative for COX-2 (data not shown). IEM of biopsy samples from untreated coeliac patients revealed that the ultrastructure of the COX-2 positive cells found under the basement membrane resembled that of lymphocytes. COX-2 immunoreactivity in these cells was localised to the rough endoplasmic reticulum and nuclear envelope (fig 1F). The above findings helped us confirm the identification of the COX-2 positive subepithelial cells in the blistering mucosa as CD3+ cells. Indeed, we were able to show by a double immunofluorescence technique that COX-2 staining and CD3 staining often colocalised to the same cell, although not all of the CD3+ cells expressed COX-2 (fig 4). Furthermore, we identified, in addition to COX-2 positive T cells, a population of COX-2 positive macrophages bearing the CD68 antigen (not shown). Double immunofluorescence staining for cyclooxygenase 2 (COX-2) and CD3 in sections from the small intestinal mucosal lesion of a coeliac patient. (A) COX-2 positive cells are red and (B) CD3 positive cells green. (C) Overlaying of the two images shows the cells that express both COX-2 and CD3 in yellow. CD3+ cells that do not express COX-2 are green. We further focused on the preliminary characterisation of the intraepithelial COX-2 positive cells observed in untreated and diet treated coeliac disease as well as in control samples. These cells were not positive for CD3, CD5, CD45RO, or CD68, which indicates that they do not belong to the same population as the cells found in the areas of blistering in the coeliac lesions. IEM disclosed that the morphology of these cells is similar to that of lymphocytes, and they have a similar intracellular distribution of COX-2 immunoreactivity as seen in cells found in coeliac lesions (fig 2B). The locations of the intraepithelial CD57+ cells corresponded to those of COX-2 positive cells but serial sectioning revealed that only a few individual CD57+ cells could be regarded as COX-2 positive. Some COX-2 positive intraepithelial cells were located at the bottom of the crypts, in areas typically occupied by neuroendocrine cells, but autofluorescence that is characteristric of neuroendocrine cells did not colocalise with staining for COX-2. We describe for the first time the presence of subepithelial clusters of COX-2 positive cells in areas where the epithelial cell layer blisters or is totally detached from the basement membrane of the small intestinal mucosa affected in coeliac disease. Many of the COX-2 positive cells in these clusters also express the CD3 antigen, which identifies them as T cells, while others were identified as macrophages, based on the presence of the CD68 antigen. The assembly of these COX-2 positive cells in specific areas under the blistering lesion supports the idea that blistering is a real biological phenomenon associated with coeliac disease, and not an artefact caused by the biopsy procedure. The biopsy procedure itself can further increase detachment of the epithelium from the blisters. 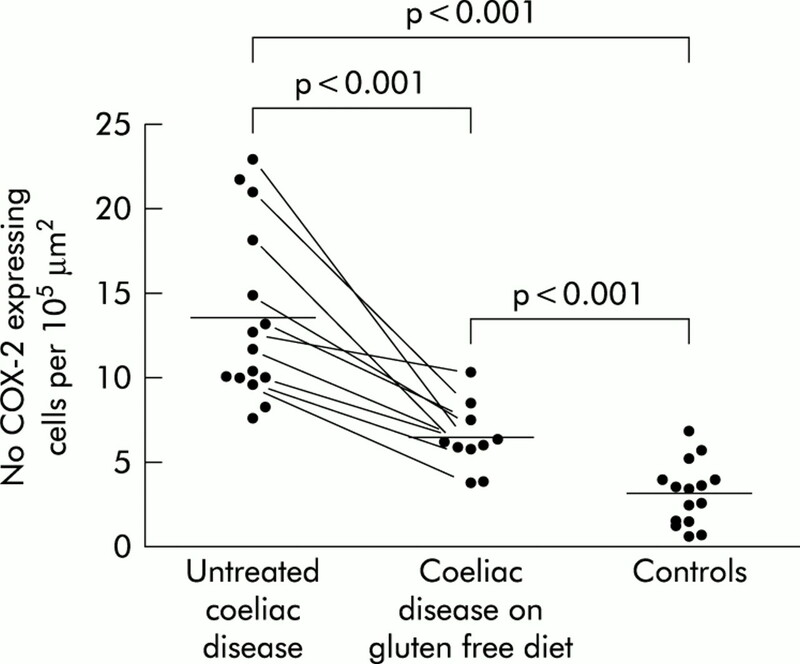 What is the role of COX-2 in the gluten triggered small intestinal lesion that develops in coeliac patients? One possibility is that COX-2 is involved in the restoration of the jejunal mucosa during recovery from the disease. This is supported by the finding that inhibition of COX-2 activity in certain transgenic mice causes a break in the oral tolerance to an ingested protein.35 In these studies mice developed mucosal lesions similar to those in coeliac disease when the function of COX-2 was inhibited with indomethacin or the specific inhibitor NS-398. Newberry et al suggested that COX-2 dependent arachidonic acid metabolites produced by mononuclear cells in the lamina propria regulate the intestinal inflammatory response to dietary antigens, thus promoting oral tolerance and maintaining intestinal integrity.35 Furthermore, prolonged use of the non-steroidal anti-inflammatory agent mefenamic acid induces steatorrhoea and other changes that mimic coeliac disease in some patients. These changes include hyperplasia of the crypts, atrophy of the villi, and increased infiltration of the lamina propria by lymphocytes.36,37 These histological changes are very similar to those seen in the transgenic mice fed a specific dietary antigen and treated with COX-2 inhibitors. The growing family of COX-2 inhibitors has proved to be less ulcerogenic than conventional non-steroidal anti-inflammatory agents and may therefore find large scale use in certain diseases, such as rheumatoid arthritis.41,42 However, if COX-2 proves to be important in the resolution of inflammation in even a small number of diseases, the long term use of COX-2 specific inhibitors will undoubtedly have to be given careful consideration. We observed intraepithelial COX-2 positive cells in both control samples and in samples from patients with coeliac disease. In the colon, intraepithelial COX-2 positive cells have been reported to overlap with chromogranin A-immunoreactive neuroendocrine cells.43 Our results show that intraepithelial COX-2 positive cells are scattered along the crypts and they are also seen in the villi, which suggests that most of these cells are not of neuroendocrine origin. The neuroendocrine cells were also devoid of COX-2 immunoreactivity when examined by IEM. COX-2 immunoreactivity was localised to lymphocyte like intraepithelial cells in which it was seen in the endoplasmic reticulum and the nuclear envelope. The significance of these cells remains to be determined. In conclusion, our results show that in coeliac disease patients with total or partial villous atrophy, the integrity of the small intestinal epithelium is disrupted by blistering, and this blistering is associated with increased infiltration of CD3+ T lymphocytes and CD68+ macrophages. A portion of these cells express COX-2, which suggests that increased prostanoid synthesis probably contributes to the healing of the mucosa. This study was carried out with the financial support of the Medical Research Fund of Tampere University Hospital and the Commission of the European Communities, specific RTD programme “Quality of Life and Management of Living Resources”, QLK1-CT-1999–00037 “Evaluation of the prevalence of coeliac disease and its genetic components in the European population”. It does not necessarily reflect the Commission's views and in no way anticipates its future policy in this area. We thank Taisto Heinonen, PhD, for revising the manuscript. Versteeg HH, van Bergen en Henegouwen PM, van Deventer SJ, et al. Cyclooxygenase-dependent signalling: molecular events and consequences. FEBS Lett1999;445:1–5. Crofford LJ. COX-1 and COX-2 tissue expression: implications and predictions. J Rheumatol1997;24:15–19. Komhoff M, Grone HJ, Klein T, et al. Localization of cyclooxygenase-1 and -2 in adult and fetal human kidney: implication for renal function. Am J Physiol1997;272:F460–8. Sakuma K, Fujimori T, Hirabayashi K, et al. Cyclooxygenase (COX)-2 immunoreactivity and relationship to p53 and Ki-67 expression in colorectal cancer. J Gastroenterol1999;34:189–94. Ristimäki A, Honkanen N, Jankala H, et al. Expression of cyclooxygenase-2 in human gastric carcinoma. Cancer Res1997;57:1276–80. Schmassmann A, Peskar BM, Stettler C, et al. Effects of inhibition of prostaglandin endoperoxide synthase-2 in chronic gastro-intestinal ulcer models in rats. Br J Pharmacol1998;123:795–804. McCarthy CJ, Crofford LJ, Greenson J, et al. 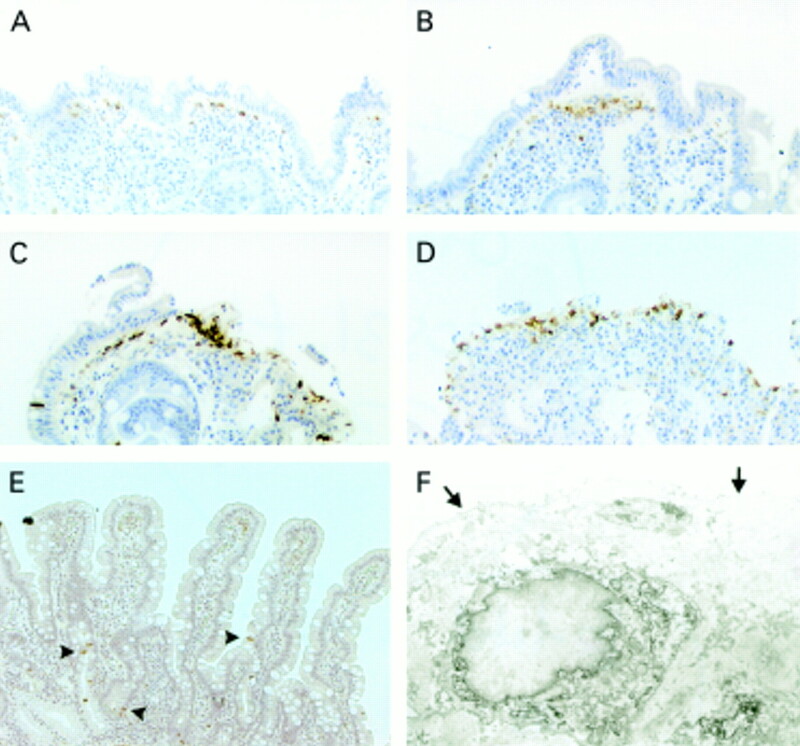 Cyclooxygenase-2 expression in gastric antral mucosa before and after eradication of Helicobacter pylori infection. Am J Gastroenterol1999;94:1218–23. Singer II, Kawka DW, Schloemann S, et al. Cyclooxygenase 2 is induced in colonic epithelial cells in inflammatory bowel disease. Gastroenterology1998;115:297–306. Williams CS, Luongo C, Radhika A, et al. Elevated cyclooxygenase-2 levels in Min mouse adenomas. Gastroenterology1996;111:1134–40. Herschman HR, Reddy ST, Xie W. Function and regulation of prostaglandin synthase-2. Adv Exp Med Biol1997;407:61–6. Mizuno H, Sakamoto C, Matsuda K, et al. Induction of cyclooxygenase 2 in gastric mucosal lesions and its inhibition by the specific antagonist delays healing in mice. Gastroenterology1997;112:387–97. Gilroy DW, Colville-Nash PR, Willis D, et al. Inducible cyclooxygenase may have anti-inflammatory properties. Nat Med1999;5:698–701. Ricote M, Li AC, Willson TM, et al. The peroxisome proliferator-activated receptor-gamma is a negative regulator of macrophage activation. Nature1998;391:79–82. Rossi A, Kapahi P, Natoli G, et al. Anti-inflammatory cyclopentenone prostaglandins are direct inhibitors of IkappaB kinase. Nature2000;403:103–8. Mäki M, Collin P. Coeliac disease. Lancet1997;349:1755–9. McLean IW, Nakane PK. Periodate-lysine-paraformaldehyde fixative. A new fixation for immunoelectron microscopy. J Histochem Cytochem1974;22:1077–83. Rantala I, Mäki M, Laasonen A, et al. Periodate-lysine-paraformalde-hyde as fixative for the study of duodenal mucosa. Morphologic and immunohistochemical results at light and electron microscopic levels. Acta Pathol Microbiol Immunol Scand [A]1985;93:165–73. Falck B, Owman CA. A detailed methodological description of the fluorescence method for the cellular distribution of biogenic monoamines. Acta Univ Lund1965;7(sect II):5–23. Weibel ER. Stereological methods, vol. 1. Practical methods for biological morphometry. London: Academic Press, 1979. Cellier C, Delabesse E, Helmer C, et al. Refractory sprue, coeliac disease, and enteropathy-associated T-cell lymphoma. Lancet2000;365:203–8. Maiuri L, Picarelli A, Boirivant M, et al. Definition of the initial immunologic modifications upon in vitro gliadin challenge in the small intestine of celiac patients. Gastroenterology1996;110:1368–78. Goldyne ME. Lymphocytes and arachidonic acid metabolism. Prog Allergy1988;44:140–52. Goodwin JS, Behrens T. Role of lipoxygenase metabolites of arachidonic acid in T cell activation. Ann N Y Acad Sci1988;524:201–7. Hoffman T, Lizzio EF, Ting A, et al. Release of arachidonic acid metabolites by human monocytes or lymphocytes: effect of treatment with interferon on stimulation by phorbol ester or calcium ionophore. Clin Immunol Immunopathol1987;44:82–92. Kennedy MS, Stobo JD, Goldyne ME. In vitro synthesis of prostaglandins and related lipids by populations of human peripheral blood mononuclear cells. Prostaglandins1980;20:135–45. Santoli D, Phillips PD, Colt TL, et al. Suppression of interleukin 2-dependent human T cell growth in vitro by prostaglandin E (PGE) and their precursor fatty acids. Evidence for a PGE-independent mechanism of inhibition by the fatty acids. J Clin Invest1990;85:424–32. Aussel C, Mary D, Fehlmann M. Prostaglandin synthesis in human T cells: its partial inhibition by lectins and anti-CD3 antibodies as a possible step in T cell activation. J Immunol1987;138:3094–9. Flescher E, Fossum D, Gray PJ, et al. Aspirin-like drugs prime human T cells. Modulation of intracellular calcium concentrations. J Immunol1991;146:2553–9. Iniguez MA, Punzon C, Fresno M. Induction of cyclooxygenase-2 on activated T lymphocytes: regulation of T cell activation by cyclooxygenase-2 inhibitors. J Immunol1999;163:111–19. Pablos JL, Santiago B, Carreira PE, et al. Cyclooxygenase-1 and -2 are expressed by human T cells. Clin Exp Immunol1999;115:86–90. Ballif BA, Mincek NV, Barratt JT et al. Interaction of cyclooxygenases with an apoptosis- and autoimmunity-associated protein. Proc Natl Acad Sci USA1996;93:5544–9. Morita I, Schindler M, Regier MK, et al. Different intracellular locations for prostaglandin endoperoxide H synthase-1 and -2. J Biol Chem1995;270:10902–8. Kanai Y, Takeda O, Miura K, et al. Novel autoimmune phenomena induced in vivo by a new DNA binding protein Nuc: a study on MRL/n mice. Immunol Lett1993;39:83–9. Kanai Y, Takeda O, Miura K, et al. Induction of autoantibodies in normal mice by injection of nucleobindin and natural occurrence of antibodies against nucleobindin in autoimmune MRL/lpr/lpr mice. Immunol Lett1995;45:35–42. Newberry RD, Stenson WF, Lorenz RG. Cyclooxygenase-2-dependent arachidonic acid metabolites are essential modulators of the intestinal immune response to dietary antigen. Nat Med1999;5:900–6. Isaacs PE, Sladen GE, Filipe I. Mefenamic acid enteropathy. J Clin Pathol1987;40:1221–7. Peacey SR, Walls WD. Steatorrhoea and sub-total villous atrophy complicating mefenamic acid therapy. Br J Clin Pract1992;46:211. Shigeta J, Takahashi S, Okabe S. Role of cyclooxygenase-2 in the healing of gastric ulcers in rats. J Pharmacol Exp Ther1998;286:1383–90. Halstensen TS, Brandtzaeg P. Activated T lymphocytes in the celiac lesion: non-proliferative activation (CD25) of CD4+ alpha/beta cells in the lamina propria but proliferation (Ki-67) of alpha/beta and gamma/delta cells in the epithelium. Eur J Immunol1993;23:505– 10. Willoughby DA, Moore AR, Colville-Nash PR. COX-1, COX-2, and COX-3 and the future treatment of chronic inflammatory disease. Lancet2000;355:646–8. Hawkey CJ. COX-2 inhibitors. Lancet1999;353:307–14. Laine L, Harper S, Simon T, et al. A randomized trial comparing the effect of rofecoxib, a cyclooxygenase 2-specific inhibitor, with that of ibuprofen on the gastroduodenal mucosa of patients with osteoarthritis. Rofecoxib Osteoarthritis Endoscopy Study Group. Gastroenterology1999;117:776–83. Nakajima T, Hamanaka K, Fukuda T, et al. Why is cyclooxygenase-2 expressed in neuroendocrine cells of the human alimentary tract? Pathol Int1997;47:889–91.